Aurora Man Takes Commitment to Pull Seriously – 9 Times! 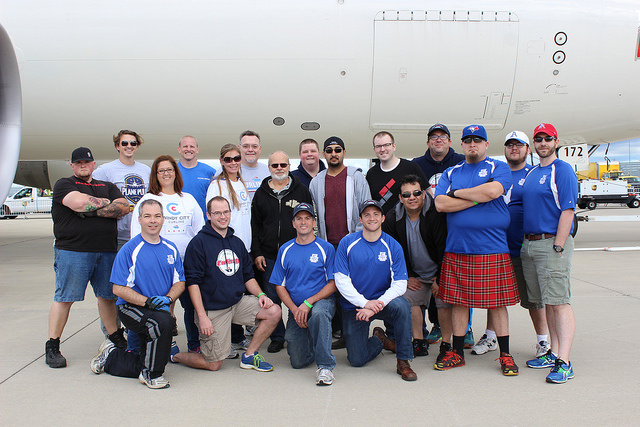 A battle of strength took place in the form of the Plane Pull at O’Hare International Airport on Sept. 19. 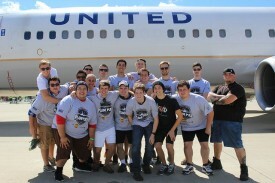 The Plane Pull features the ultimate tug-of-war competition, as teams of up to 20 battled a UPS Airbus A300 or United Airlines 737, weighing about 190,000 pounds. One man proved to be the strongest that day. Since 2011, Josh Ozbirn of Aurora has pulled on the Windy City Curling Club’s team (top photo). However, Ozbirn doesn’t stop there. He also pulls with other teams needing someone to complete their team of 20. This year, Ozbirn pulled with nine different teams. “When the pull is over, I take the pictures, congratulate the team and walk back. I ask the next teams if they need people, already prepared to pull again and again. I can’t get enough,” said Ozbirn. He has become a staple of the event for a few years and can be spotted in many of the team pictures. Ozbirn loves seeing the returning teams and the first time pullers. Each team raised a minimum of $1,000 to participate. This year’s Plane Pull raised more than $150,000 for the athletes of Special Olympics. Ozbirn looks forward to next year’s event and encourages anyone who hasn’t participated in the Plane Pull to get involved. “No discrimination, no prejudice, just pure teamwork and when it is over and rope drops, the hugs are simply unbelievable,” said Ozbirn.